As a gardener, it is not lost to you that individual seedlings do well indoors before transferring them outdoors. However, some of them like the corn, carrots, and sunflower do not require this head start. They are good starting right outside with the weather. The reason for growing particular seeds indoors is because some of them take too long to develop. They need some extra time before they can come of age to withstand the rigors of outside environment. If you were to plant them directly, these seedlings would get lost with the rest of them. Growing these plants indoors requires a particular kind of medium. You need the best seed starter kit to ensure your onions or petunias thrive during the growing season. 1 What is a Starter kit? As mentioned above, some seedlings just don’t do well. They need close supervision and particular attention so that they can wiggle out of the initial growth stage. A starter kit is a special kind of medium that aids the seedlings germinate and be resilient during the early stages. There are various options available to you to utilize as growing medium. First, you need to determine the kind of container you are going to employ. It can either be a milk carton, recycled plastics or a commercially available seed starter system. The thing about starter kits is that they make growing seedlings seem so comfortable by providing the best conditions for growth. If you want to skip the hassle of having to determine the best condition for your plants, then you can consider these kits godsend. The type of seeds: the way you need to deal with onions is not the same way you can deal with marigold. Some seeds can grow quickly from any medium you choose. However, there are others that will seem problematic. They will take their time to show their head off the soil and continue growing – these are not the types that you used in high school projects.Seeds like pepper can take a couple of weeks to germinate and several more to grow and be ready for transfer to the garden. These slow growers need a consistent level of temperature and moisture to develop appropriately. Depending on the kind of plants you are dealing with, choose the right starter kit, and you will not have problems. The speed: an excellent growing system takes into account the rate at which a seed will germinate and grow thereafter. Snapdragons can take weeks while melon seeds take a shorter time. A starter kit for the slower growers needs to provide the best environment for the seeds over the long haul. The seed size: zinnia seeds are big enough to plant in their own space. However, snapdragon and others like it can prove tricky as they are tiny. If you are using the traditional methods like a pot or cup, you may need to use the experience to know the most appropriate way to plant them. A starter kit may come labeled or with instructions on how to go about it. A heat map: some of the best seed starter kits will come with a heating pad underneath it. These heat maps help the seeds germinate faster. If the kit does not include this feature, you can purchase it – it plays an important role. A Greenhouse cover: it is imperative that the kit has excellent water retention. It should have proper drainage and be adequately porous to support the growth of the young plants. Remember that these seedlings need special care to thrive and too much water can be overwhelming. You will find some kits with a clear plastic rid to contain humidity and moisture necessary for the germination and growth. Once the seedlings are big enough, you can remove it. Tray material: the majority of them are made of plastic which is good as it holds in water. It is light and can last an extended period. There are also others made of biodegradable resin. Be careful not to confuse this material with others like paper, plant fiber or peat. One good reason to consider the biodegradable peat a good option is that you can throw it into your compost pit and become manure to continue helping your plants grow. As a gardener, going the biodegradable way is attractive. The planting medium: this is one of the most critical factors. Soilless and sterile mediums are the ideal. They prevent damping off and diseases. Currently, coconut coir is growing in popularity as a starting medium. They allow adequate aeration of the roots and reduced mess. You can still buy coconut coir separately in the form of form of pellets to add to your kit. If you are in the market for a good seed starter kit, this may be the real deal for you. For starters, this is a generous water reservoir that neither holds too much nor too little of it – maintains the perfect moisture for germination and growth. This kit is made from recycled plastic, durable and environmental-friendly. The product is also easy to clean, and all you need to do is throw it in the dishwasher – no special handling. If you are looking to grow tomatoes, this starter kit will help in your goal of healthy and succulent looking vegetables. 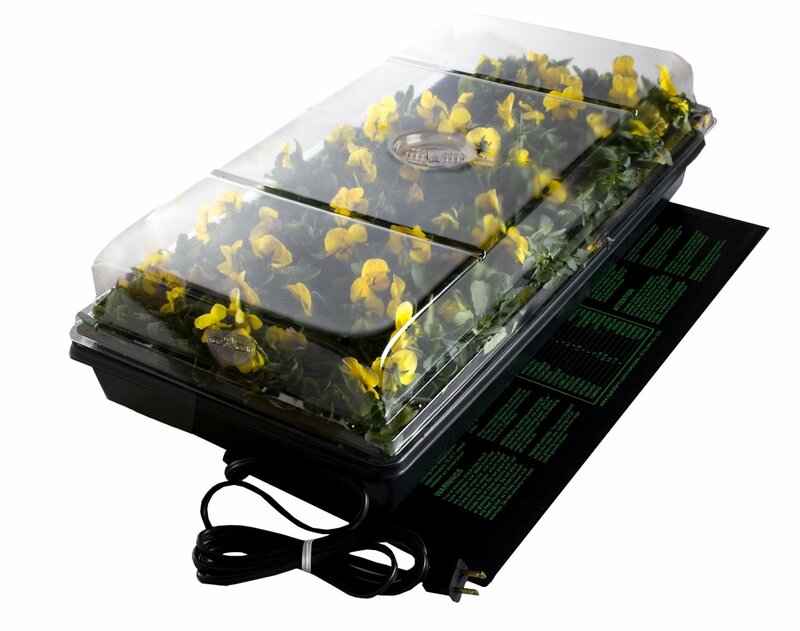 The kit includes a cell tray, germination dome, a water reservoir and capillary mat. The only thing that you need to add is the seed starting mix. This is a highly rated planting kit that comes as a pocket-friendly option. Starters in gardening are most likely to shy off from something premium priced, and this kit is one that balances quality and price. It can also be the perfect gift for that friend or relative that has been raring to start gardening. 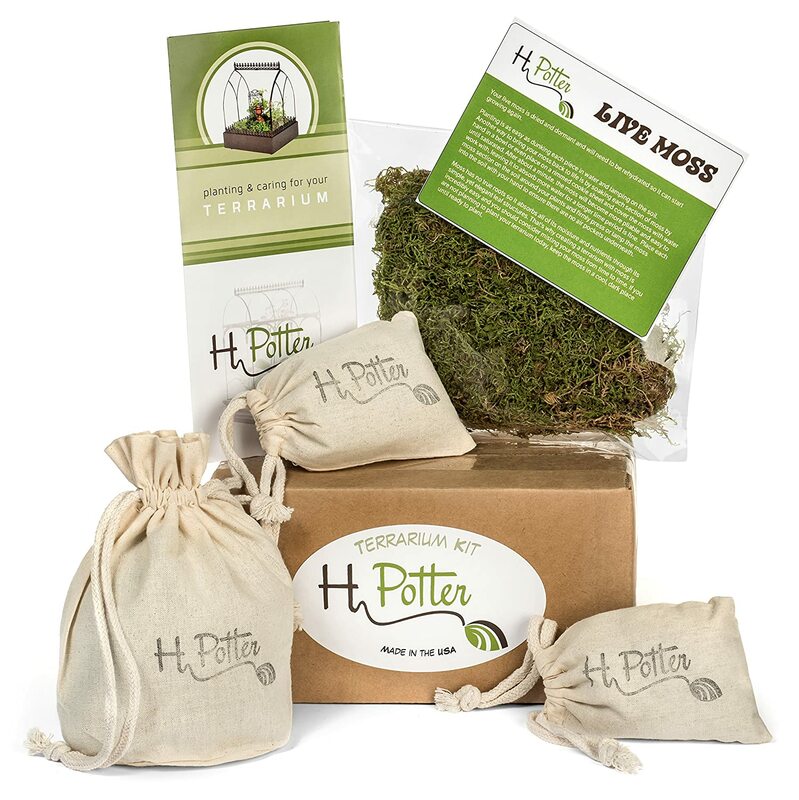 The kit includes soil, real live moss – natural -, activated charcoal, and pea –gravel. 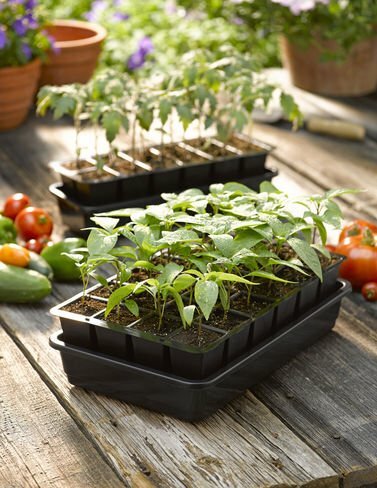 In simpler terms, this package is everything you need to start a small garden for your seedling. It’s always fun and healthy too to have a vegetable garden. It gets even much better if yours are exotic vegetable – your friends will be amazed at your green thumb. 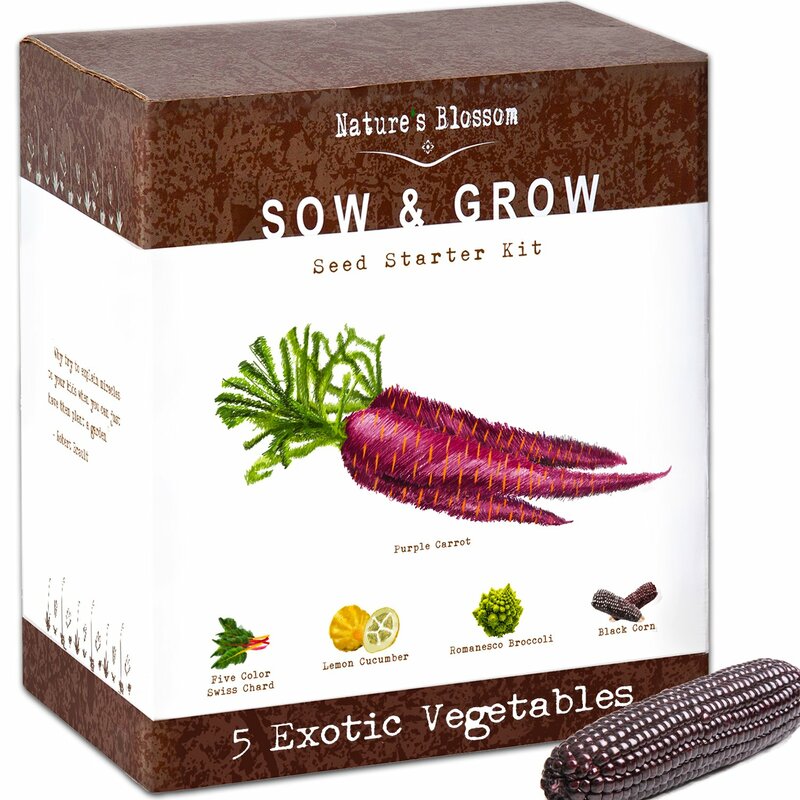 This kit helps you start an exotic vegetable garden efficiently and cost-effectively. You will find five types of exotic seeds, plant markers, soil discs and biodegradable planters – everything you need. If you are a beginner, this kit is quite user-friendly as it has everything including step-by-step instructions to turn your thumb into a green one. This kit also comes with a nice gift box that you can use to send to someone dear. However, these vegetables are best planted outside. Some seeds generally take longer to germinate and grow. However, a heat map can quicken this process and take a shorter time to have your plants. This kit is 2-inch humidity dome. It is water resistant and comes with a watertight base tray. And if you are planning on having many plants, this station can comfortably support up to 72 seeding inserts. Beginners need not worry too much as it comes with an easy-to-follow instructional manual. The good thing about this germination station is that you can use it to grow your plants indoors away from insects and hash elements. 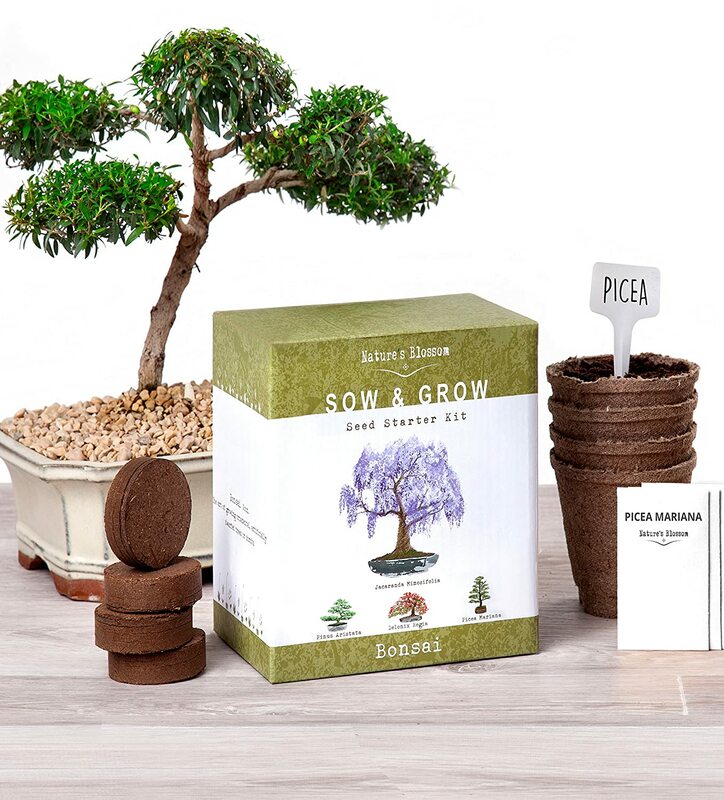 This kit is specially made for those that want to plant bonsai trees. In fact, it contains everything that you may need to nurture the trees through germination and early stages of growth. This kit comes with three organic seeds and pit soil discs. The growing pots are biodegradable, and their disposal will not be a problem when you are done with them. By using the best seed starting materials, the growth rates are pretty high. You small trees get all the necessary nutrients they need to thrive. There are some plants that you just can’t leave outside to germinate and grow on their own. You may need to give them a start indoors by providing the best conditions. The seed starter reviews provides your plants with the appropriate conditions to germinate and thrive. All the above kits would make a good choice depending on the kind of plant you need to grow. However, the best among them is GrowEase Self Watering Seed Starter Kit. You can basically produce anything with it and has several cells for that purpose. It is easier to use and has a good drainage and moisture retention.